A little more work, and here we are ready to release version 2 of Sneak-O-Scope. A couple of features have been added, suggestions from users incorporated and a bug fixed. If you are new to this widget, you can take a look at the blog of this application. Self visits are no longer recorded. Hence, you will see only visits by others on your profile. Details of the visitor are not recorded better. If the viewer has also added the application, their Orkut profile is shown. The last 10 visits are shown in the table described above. Some users also complained that visits to their profile were not recorded. 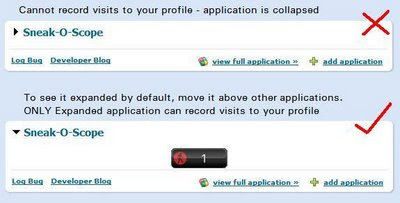 We noticed that the application was collapsed in the profile page. Please note that the application MUST BE EXPANDED on the profile page to record visits. You may have to move the application above some applications to keep it expanded by default. Some features that we are looking in the next feature include publishing updates on the activity stream, robust server support, and many more. So watch out this space for updates. Also a reminder. This is an open source project, so please drop us a line if you would like to contribute.